Visual content is so important these days. Not only are graphics and images used to supplement text within blog posts and websites, they are key to clicks and engagement on platforms such as Instagram and Pinterest. But if you’re not a professional photographer or graphic designer, just the thought of creating visual content can make you feel queasy. You’ve just spent all this time writing valuable content for your audience, so you don’t want them to click away due to bad photos. Don’t worry – I’ve got you covered. Join my upcoming workshop to learn how to take your own photos for blog posts or social media. Need some additional motivation? 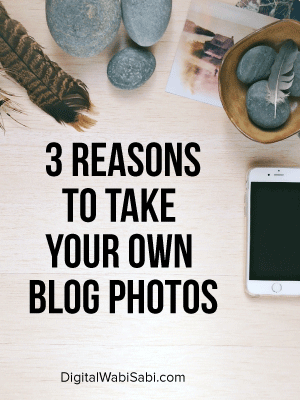 Let me share with you 3 reasons why taking your own blog photos is better than using stock images. Pinterest is dripping with pins about the best places to find free stock photos. While many of the sites do indeed offer beautiful images for you to use; the problem is everyone else is using them. It is so frustrating to search an hour to find the perfect free stock photo to use and then immediately see others using it. Not only is that frustrating, but it is also confusing to your audience. Wouldn’t you rather stand out as unique? Searching through those free stock photo sites can be frustrating if you are trying to achieve a certain look with your brand. Maybe you can find a photo with your brand colors in it, but it contains men and your audience is women. Or perhaps you want a laptop photo for a blog post about your Dell laptop and all the on brand photos you find feature Macs. Instead of driving yourself crazy trying to find the perfect photo, use what you already have and you are destined to feel authentic. Additionally, you can create a makeshift studio in your home and take a bunch of photos at once. By setting aside time once a month, you can take and edit all of your blog and social media photos in one fell swoop. By batch processing your photo taking, you will eliminate wasting time on blog post day searching through those stock photo sites. So, now that you are convinced taking your own photos is a good idea for your online brand, let me show you how easy it can be to snap your own pics.